This slender volume contains retellings of three Kafka pieces. "The Metamorphosis," of course, along with "Excursion in the Mountains" and "Josefine the Singer or, The Mouse People." The latter two I am ashamed to admit I was completely unfamiliar with, so this book was my first experience with them. This is a beautiful book which stands alone as a piece of art. That's my appraisal. The artwork is just extraordinary. Edward Gorey is, I think, the first reference-point many will make, but the line-work is much more detailed than anything Gorey ever did. 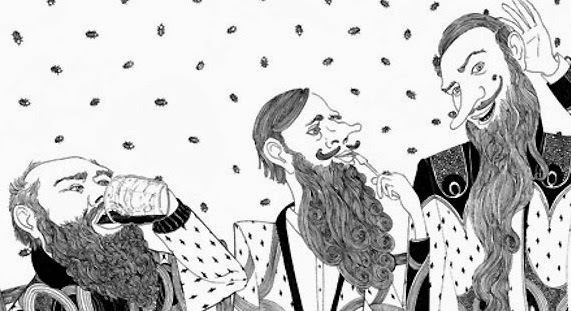 Look at the full rolls of thick beards of the "three strange men with long beards" who have moved in with the Samsas, the way their beards roll and tumble like tiny strands of insane pasta, each individually realized. "Come in here, where it's warm and happy!" There's a whole world of illustration to get lost in. The Nobodies from "Excursion..." might frustrate, as there are so many of them, each illustrated nearly identical to the other, standing so close that one is nearly indistinguishable from the other. 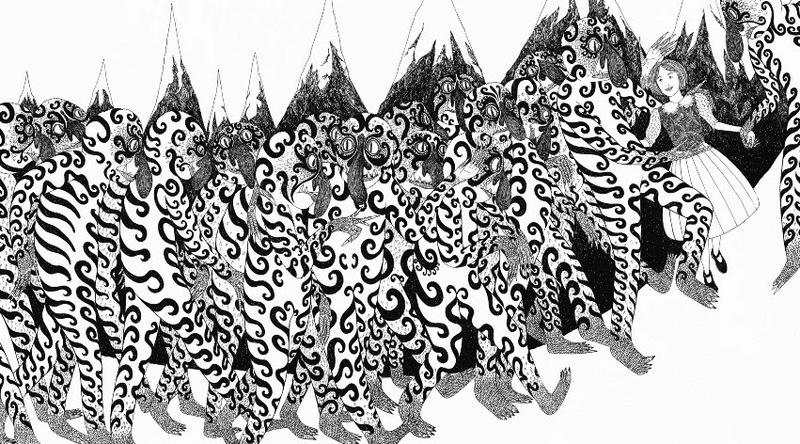 It's hard to get a grasp on what the eye is seeing, movable wallpaper with claws and reptilian-eyes, bulbous schnozes. It fits the tone of the prose perfectly. How these nobodies jostle each other, their arms linked together, these numberless feet treading so close! 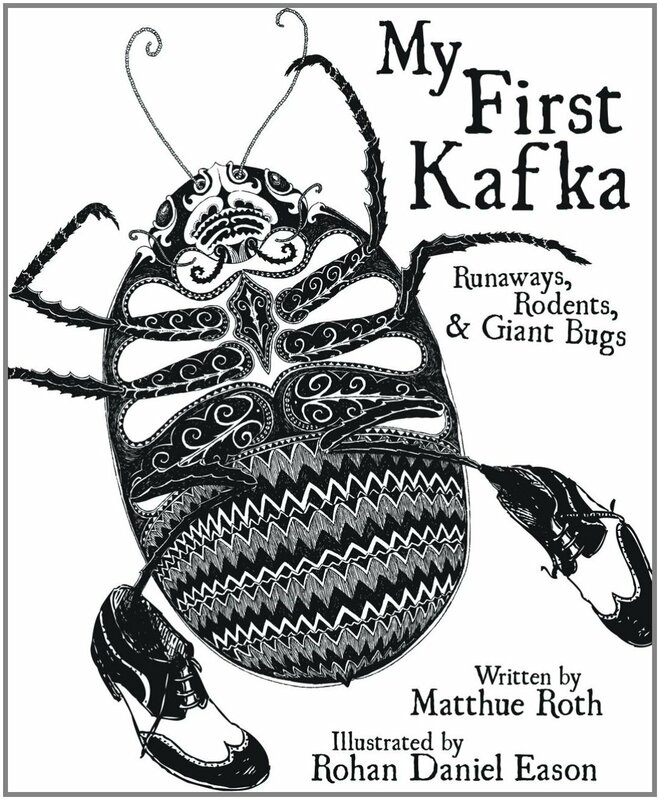 I was a bit taken aback by the title, "My First Kafka," I have to admit, as it seems designed to merely elicit a chortle. "What? 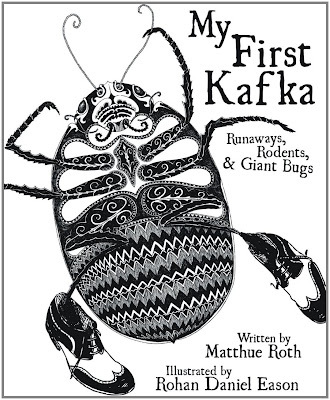 Franz Kafka stories for children! How zany!" one might imagine one exclaiming. But I didn't find it zany at all. I think there's a lot here that children and adolescents can definitely relate to. These adaptations don't just merely simplify the prose to be more readily relatable, they distill the essence of the tales so that their emotions are more readily relatable. "Gregor!" his mother called. "Are you sick?" But don't take my word for it. This book has a real money-quote on the back, from a PhD, Dr. Mayim Bialik. "Matthue Roth continues to astound with his brilliance and novelty," she writes. "Everything he touches turns to mystical and delightful artistic gold. Fearless, funny, and fantastically fantastical." 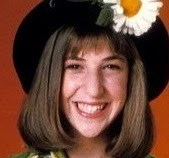 Trying to figure out the connection between TV's Blossom and Matthue Roth led me to this entry on his blog, in which he has a really interesting conversation with her about her work in neuroscience and her relationship with Orthodox Judaism. 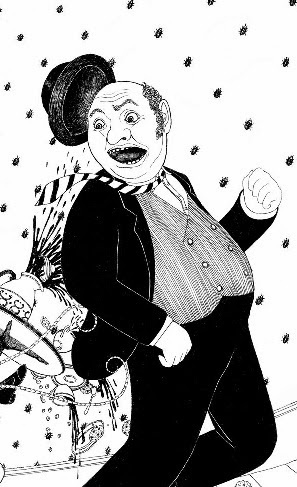 Kafka seems so well-suited to the world of children's literature, I can't believe I never thought about it before. I remember when I was a kid, I felt so cool reading The Trial, and watching the amazing Orson Wells adaptation with Anthony Perkins (I was a strange kid), feeling that I was really entering the world of grown-ups, grown-up novels, grown-up films, but I missed out on a lot by having that attitude, I think. I was always trying to read up. I didn't want to read anything which was intentionally relatable to my own life at that time, because why would I? 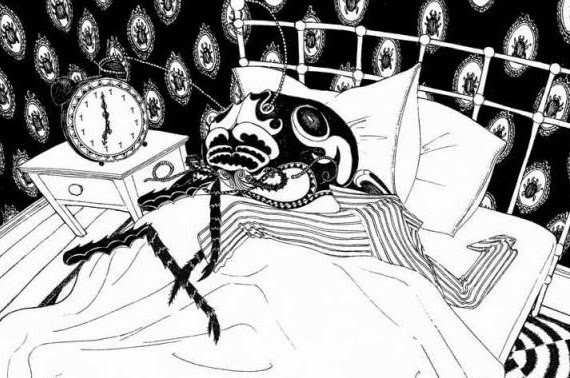 The Metamorphosis can certainly be seen as teenage/pre-teenage angst, filled with surreal and fantastic imagery. This is not just a clever retelling of stories, it is done sincerely and with great earnestness.